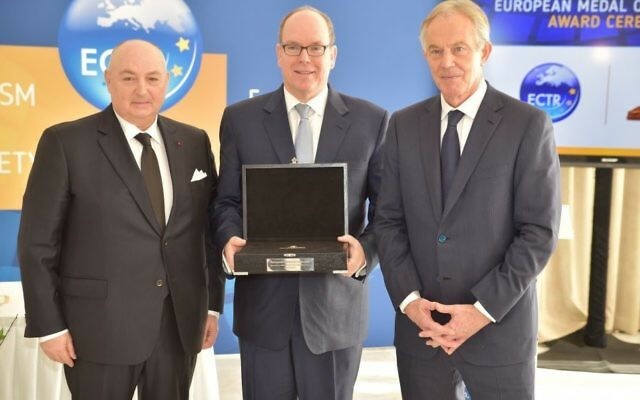 Prince Albert of Monaco receiving the 2018 European Medal of Tolerance. 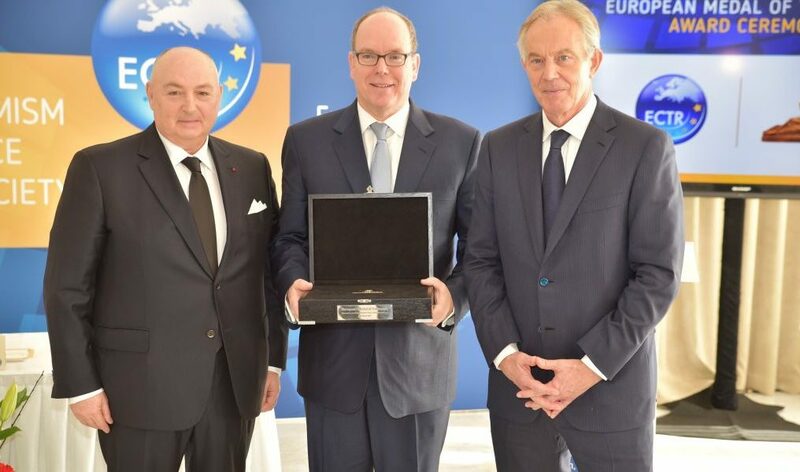 (From left” ECTR president Moshe Kantor, Prince Albert II and Tony Blair). Photo courtesy of ECTR. A prestigious think tank on tolerance comprising former European leaders honoured Prince Albert II of Monaco for his apology for his country’s treatment of Jews during the Holocaust, among other actions. The European Council on Tolerance and Reconciliation on Tuesday bestowed its European Medal of Tolerance to the head of state of the principality sandwiched between France and Italy, who in 2015 acknowledged his country’s rounding up and deportation of 66 Jews in 1942. “You have found the courage and political wisdom to openly address painful history and difficult memories,” said Moshe Kantor, the head of the European Jewish Congress and the president of the council, whose chair is former Prime Minister Tony Blair. The council’s dozen-odd members include Spanish former prime minister José María Aznar, former prime minister of Sweden Göran Persson and the previous president of Poland, Aleksander Kwaśniewski. Monaco’s asking of forgiveness for its police’s role in the murder of Jews during the Holocaust was a belated gesture, coming two decades after similar apologies by heads of state in France, Belgium, Italy and Austria. But because of the principality’s size and the small number of victims from its territory, Monaco’s political establishment was not under the external and internal pressure and scrutiny that preceded the apologies in those larger countries and others. In a speech during the medal awarding ceremony at a conference hall at Monaco’s famed Casino Monte Carlo, Prince Albert II on Tuesday described his apology as a gesture rooted in the need to remain faithful to historical record on the Holocaust.